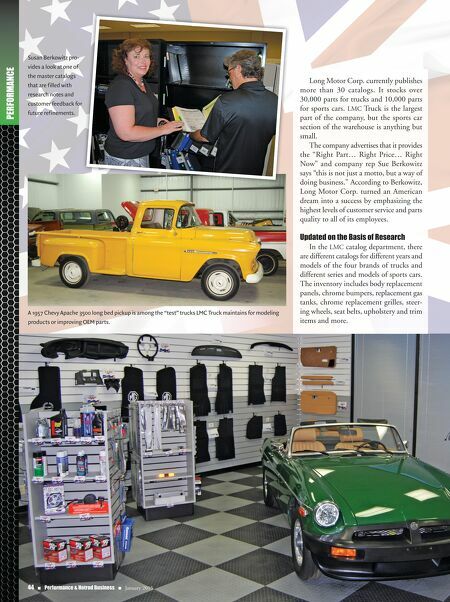 PERFORMANCE 44 n Performance & Hotrod Business n January 2015 Long Motor Corp. currently publishes more than 30 catalogs. It stocks over 30,000 parts for trucks and 10,000 parts for sports cars. 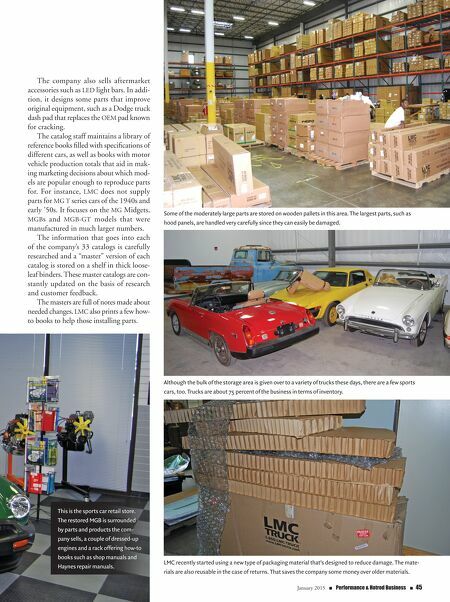 LMC Truck is the largest part of the company, but the sports car section of the warehouse is anything but small. The company advertises that it provides the "Right Part… Right Price… Right Now" and company rep Sue Berkowitz says "this is not just a motto, but a way of doing business." According to Berkowitz, Long Motor Corp. turned an American dream into a success by emphasizing the highest levels of customer service and parts quality to all of its employees. Updated on the Basis of Research In the LMC catalog department, there are different catalogs for different years and models of the four brands of trucks and different series and models of sports cars. The inventory includes body replacement panels, chrome bumpers, replacement gas tanks, chrome replacement grilles, steer- ing wheels, seat belts, upholstery and trim items and more. Susan Berkowitz pro- vides a look at one of the master catalogs that are filled with research notes and customer feedback for future refinements. A 1957 Chevy Apache 3500 long bed pickup is among the "test" trucks LMC Truck maintains for modeling products or improving OEM parts.